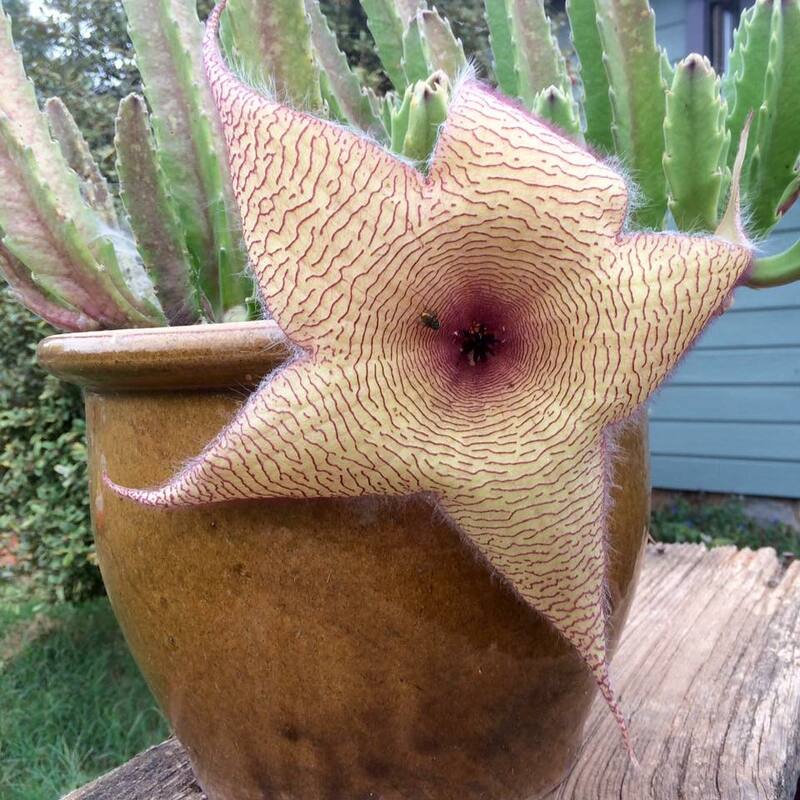 A perfect flower for this sucky day — the stinky carrion flower! Can you see the bluebottle fly drawn by the horrendous odor? This would be the day for going stark-raving, nutso, bat-crap, screaming like a banshee, inhaling everything in sight, edible and non-. The air is like damp, gray wool. I’m reading William Styron, the master of depressive darkness. It’s Daughter’s Day and one daughter won’t answer the phone, the other had her daughter answer rudely. I’m afraid to call the third because if she’s not sticky sweet, I’ll be over the gunwales into a sea of despair. Stoic the Vast worked overtime yesterday and is hammering away at the new deck railing this morning. Even if we had money for a fun excursion this afternoon, he’d insist on mowing the lawn because we’ll be gone next weekend (having fun, I hope). I know. First World problems. But cravings aren’t any more susceptible to logic than addicts, and any excuse will do in a funk. I need to build a ladder out of the morass, so I’m attacking the funk with my Weight Watchers weapons. I’ve planned a 30-minute walk in a new, nearby park this afternoon, followed by a kid-size ice cream cone. With the sure knowledge that I’m weighing in tomorrow, I’ve fixed a 6-point supper entrée that I’m eager to eat (see below). I will hit the 30-pounds-off mark tomorrow or collapse trying. And I will feel better when that happens, just as my spirits lifted yesterday when I discovered another inch was gone from my so-called waistline (more of a guideline, really). Heat oven to 400°. 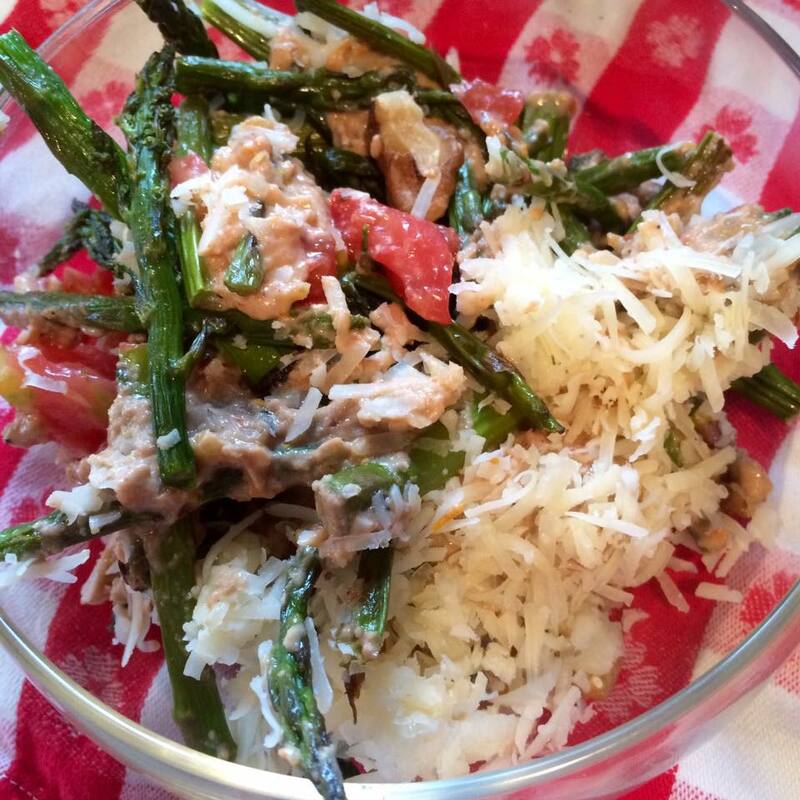 Place asparagus on edged baking sheet; toss with 1-1/2 teaspoons oil. Roast for 12 to 15 minutes or until crisp-tender, shaking the pan twice. Cut 1 cup tomatoes in half lengthwise (or if using regular-size tomatoes, chop and seed) and place in bowl with asparagus and 2/3 cup walnuts. Toss gently to combine. Place remaining tomatoes in small saucepan with 3 tablespoons liquid, anchovy and remaining 1-1/2 tablespoons oil. Cover and bring mixture to boil. Reduce heat and simmer 12 minutes or until tomatoes burst. Cool for a few minutes and transfer mixture to food processor or blender; add salt, pepper and remaining walnuts.Process until smooth. Pour over asparagus mixture and toss to coat. Let stand at room temperature 15 to 30 minutes for flavors to mingle. Arrange on platter; sprinkle evenly with cheese. Makes 6 2/3-cup servings, 6 Weight Watchers points each. And p.s., just talked with our middle daughter and she said my granddaughter was saying “But I (can talk to you) not “So, bye” as I thought. And they were wondering what was up with me! Makes either a light entree or a solid side with cheese and walnuts providing the protein. The dressing’s pink color is a surprise. Also, you can see I bought skinny spears by mistake. Previous: Previous post: A new decade; best marinara sauce ever! Next: Next post: Punkin for pie. Also soups, pasta dishes, bread, etc., etc., etc. Good choices, and glad the misunderstanding got cleared up.